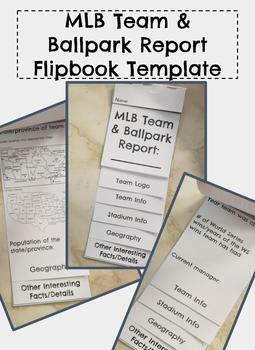 MLB Team & Ballpark Report Flipbook, editable/minimal prep for teacher! This flipbook was created in Google Slides, so you can edit the pages as you'd like for your students! The primary goal of this project is to let students get practice with researching information on the internet. Is there parking for the stadium? I have also included a couple of websites that could be helpful for your students to have. I recommend printing this, letting the kids assemble it, and posting helpful links (mine or any you find!) on Google Classroom or your school's LMS. You can create an extension activity by asking students to add different combinations or hot dogs/drink, create a new mascot, etc. You can have students create multiple flipbooks for various MLB teams/ballparks. If you do multiple, I would recommend gluing them into Social Studies interactive notebooks to keep them organized.